Design Placement is Easy! 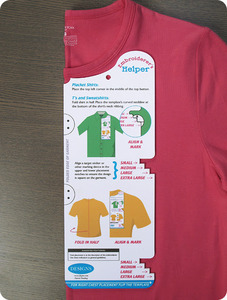 The Embroiderer's Helper is an easy solution for positioning left and right chest embroidery designs on tees, sweatshirts, and placket shirts. No more guesswork or misaligned designs! Compatible for shirt sizes from Small to Extra Large. Design placement on garments just go easier! 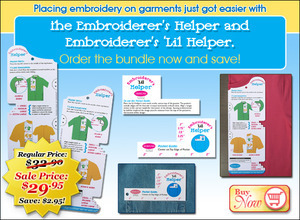 Order the Embroiderer's Helper and the Embroiderer's 'Lil Helper. This is a fast and simple tool for positioning embroidery designs above pockets. 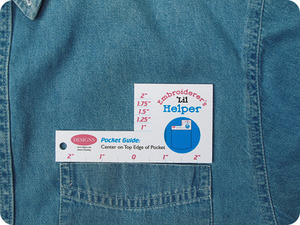 Place the 'Lil Helper's zero mark on the center top of the pocket. The pocket's outside edges will hit the ruler in equal increments on both sides. 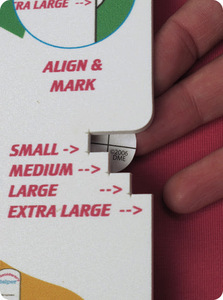 Align a target sticker with the correct height marking for the center of the design. 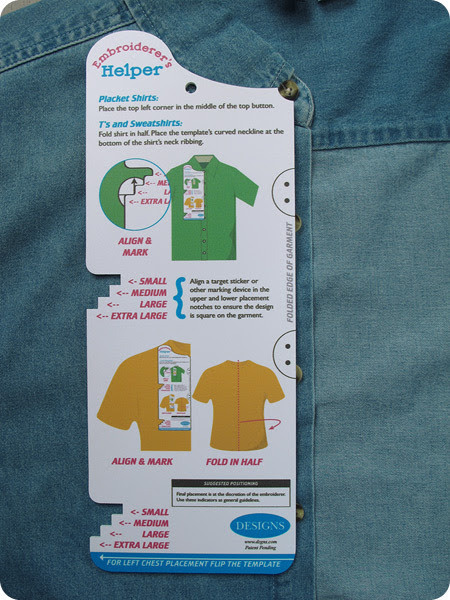 Determine the design's center by adding half the design's height plus the distance from the top of the pocket to the bottom of the design. Ideal for Placket Shirts. Place the top left or right corner in the middle of the top button. Place a target sticker or mark the upper and lower placement notches to make it easy to keep the design straight in the hoop. Align the curved button notch on the Embroiderer's Helper with the top button. 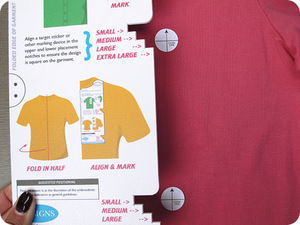 Place a target sticker or other marking device in the notch that corresponds with the shirt size. Ideal for T's and Sweatshirts. Fold the shirt in half. Align the template's curved neckline at the bottom of the shirt's neck ribbing.